I have long been a fan of Lois McMaster Bujold's Vorgkosigan books (science fiction/space opera with amazing characters and world-building). I reluctantly moved from that beloved universe to try her Challion books, and I loved those, too. So of course I went on to her Sharing Knife series with fairly high expectations, and, no surprise, I've been enjoying it as well. I opted for the audio versions when I discovered that they are read by Bernadette Dunne, who narrates a lot of the Tamora Pierce novels. I love the way she does all the different voices and expressions of the characters, so I popped over to my library's Overdrive site and checked this one out to download to my iPod. The book is very much a romance, but unlike so many that have just the trappings of a fantasy world as a backdrop, this one is solidly rooted in the fantasy world to the extent that, without the magical elements, the story would completely fall apart. I like that. Fawn is a young woman who is running away from home because she is pregnant, the young man who is the father has refused to marry her, and she is unwilling to confess to her family what has happened. Instead, she's decided to pass herself off as a widow and begin a new life elsewhere. When she is abducted by a bandit and a nightmarish creature and, when things look grimmest, is rescued by a man from the mysterious Lakewalker people, Fawn is drawn into a world where things she'd only heard of as legend turn out to be real. Dag, a patroller whose duty is to protect the land (and its people) from demon-like creatures known as malices, finds in Fawn anything but the ignorant, timid farmer girl he'd been expecting. Her curiosity, intellect and bravery as they work together to fight the malice soon have Dag falling head over heels for someone young enough to be his daughter. This is a charming romantic story that took its time in the telling but definitely held my attention throughout the course of the novel. It was refreshing to have a tale unfold that did not rush from adventure to adventure, but instead left time to show the characters growing and changing from each encounter. 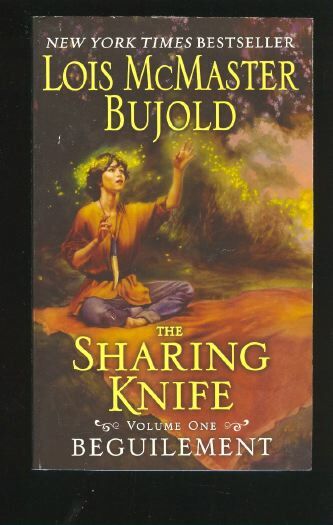 Bujold is a masterful storyteller in whatever genre she chooses, and I look forward to reading any and everything that she decides to write. 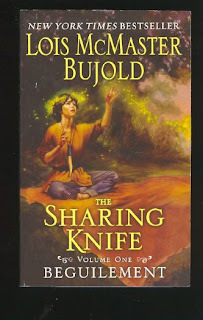 Fans of romantic fantasy will enjoy this one, and I wouldn't be surprised if romance fans will be willing to venture into uncharted territory with other books by Bujold after reading this series. Aneca's World: "She is very good in the world building department. So good in fact that I did not feel this was romance but that it was fantasy with a romantic element and I still loved it." Fyrefly's Book Blog: "I think it’s worth a try for anyone who is looking for a light read with a solid love story, and doesn’t mind the fantasy trappings (or, alternately, anyone who’s looking for an interesting fantasy world and doesn’t mind a serious dose of romance)." Romance Book Wyrm: "I would definitely recommend this book to those that love a good fantasy romance. This is a five star book, in my opinion!" I am curious about this book, but I think I will probably read Vorgkosigan first. I've never read any Lois McMaster Bujold before. Somehow I think I must have in the past, but after scanning the titles listed in wikipedia, none of them ring familiar. I've been reading a lot of young adult fantasy/sci-fi lately, I kind of miss the old school ones...perhaps I shall pick this one up? Kailana - I'd definitely do the Vorkosigan ones first, unless you're in an otherworldly romancy sort of mood (not that there isn't romance in the Vorkosigan saga - there is, but there's a lot more swashbuckling space adventure, too). I'm going to try the vorkosigan book - shards of honor (it's the first one, right?) anyway, I'm getting excited! !